Sandalwood may be a longstanding and ever-popular staple of the cosmetics industry – particularly in men’s cologne and aftershave – but there’s more to this captivating essential oil than its signature, woody fragrance. From historic Ayurvedic medicine to modern mental health, sandalwood has been used for generations, and is favoured for its calming, therapeutic scent. Here, we explore the origins and history of this beloved essential oil, and delve into what makes it the perfect fragrant accompaniment to your home. Where Does Sandalwood Oil Come From? Sandalwood essential oil is derived from sandalwood trees, a class of heavy, fine-grained woods which all produce an aromatic, long-lasting scent. It’s this distinctive fragrance which makes sandalwood oil such a highly-coveted ingredient, and, after centuries of cultivation, the oil has emerged as one of the world’s most expensive and desirable natural extracts. While sandalwood trees grow throughout the world, some regional species are more favoured for their fragrance than others, with notable varieties including Australian and Indian sandalwoods. Australian woods, in particular, are widely cultivated for their high oil-level and warm, creamy fragrance – making them perfect for use in cosmetic products and home scents. In order to attain valuable sandalwood oil with a sweet, long-lasting fragrance, trees are only harvested when they’re at least 15 years old. In Western Australia, which is known to produce some of the world’s finest sandalwood oil, santalum trees are cultivated when they’re much older – a practice which produces a stronger and more fragrant essential oil. Given the value of sandalwood, producers go to great lengths to extract maximum profit value from every santalum tree. Rather than cutting at the stump, the whole tree is removed from the ground so that the roots, which contain large quantities of oil, can be cultivated alongside the trunk and branches. Currently, the best-quality sandalwoods of Western Australia can fetch anywhere in the region of AUS$16,000 (roughly £9,000) per tonne – a testament to the quality of the sandalwood oil produced here. What Are the Historic Uses of Sandalwood? Sandalwood is among the world’s most treasured natural extracts, cultivated and used for generations across Asia, Australia and the Pacific. Immensely popular in modern cosmetics, sandalwood oil has an impressively long history – with its earliest uses dating back over 5,000 years. While Australia is perhaps one of the region’s most synonymous with sandalwood cultivation, the extract is more closely interwoven with the history, heritage and culture of India. 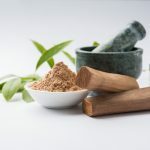 For thousands of years, sandalwood has been used widely across this sweeping Asian nation, featuring in everything from religious ceremonies to Ayurvedic medicine and aromatherapy. Sandalwood has been harvested in India for over 5,000 years, with Ancient Egyptians importing the wood to use in medicine and for embalming their dead. In India itself, the extract was first used during religious ceremonies, with the aroma being an integral part of the country’s three main religious groups: Buddhism, Hinduism and Islam. In Hinduism, particularly, sandalwood is considered sacred. Indian Hindus use extracts from the wood to pay homage to the God Shiva, creating a paste which is used to mark the forehead during religious ceremonies. Away from religion, sandalwood has long been used in medicine, with Ancient Egyptians, Chinese and Japanese civilisations using the wood for its healing and restorative properties. In more recent times, sandalwood has found favour with aromatherapists and those associated with alternative mental health treatments – with its mellow, soft fragrance supposedly offering calming benefits. 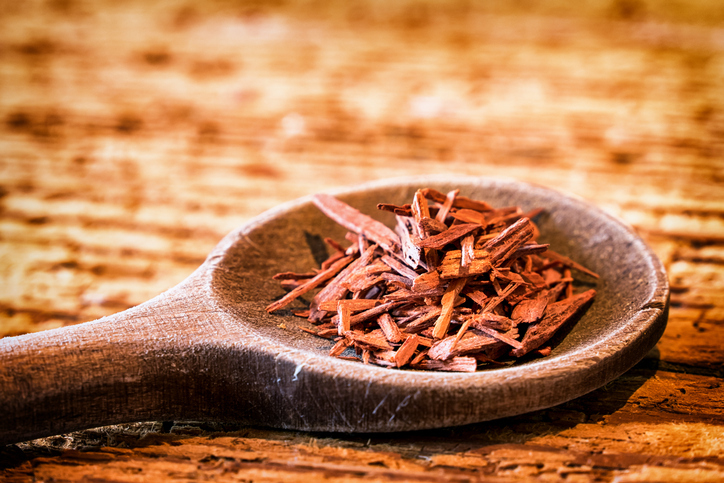 In its pure, essential oil form, sandalwood has historically been used to treat muscle soreness, as well as an antiviral and antibacterial ointment. While it’s rarely used for medicinal purposes in developed countries today, many communities in India and Asia still use sandalwood oil for its antispasmodic and antiseptic properties. From its hallowed status in Hinduism to its popularity in contemporary cosmetics, few natural extracts are as universally beloved as sandalwood. But what, aside from the fact that it smells amazing, do you need to know about this incredible, versatile extract? Discover our pick of the most fascinating facts about sandalwood below. Sandalwood trees are semi-parasitic, which means they actively steal nutrients from other nearby plants. As well as normal tree roots, they also feature tube-like growths called haustoria, which grow into the root structures of other organisms and tap into their nutrient source. Most of the sandalwood extracts found in cosmetics and perfumery are derived from a by-product of steam distillation. Often called ‘sandalwood water’, it carries the distinct fragrance of sandalwood trees and is incredibly long-lasting. 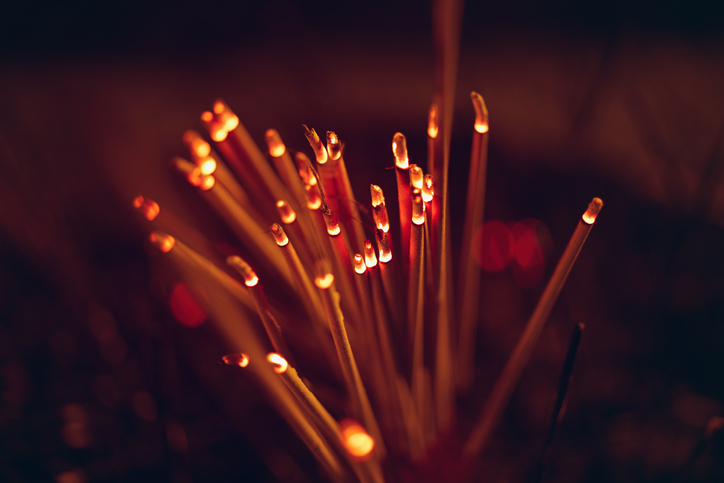 In Indian cultures, sandalwood is ground down for use in incense sticks, and often burnt during religious festivals. In fact, sandalwood is widely-considered to be the national scent of India, with most families burning the natural extract in their homes. The most expensive sandalwoods are harvested when the trees are around 60 years old. The older the tree, the stronger, more powerful and long-lasting the fragrance. This is particularly true of sandalwoods cultivated in Western Australia. In aromatherapy, sandalwood has many benefits. Its sweet, soft scent induces relaxation and calmness, and promotes positive thinking, clarity and aids concentration. Many people believe it can also help boost memory, but this isn’t yet proven. Sandalwood has a very distinctive fragrance, and is one of the most commonly used natural extracts in modern perfumery. Quality sandalwood should have a soft, warm, smooth and creamy fragrance, with a long-lasting bouquet that invokes the milky woodiness of the heart tree. It’s often paired with citrus fragrances to create a rounded nose of scent, and also complements white florals such as jasmine and gardenia very well. The process of distilling sandalwood takes longer than any other natural extract. That’s because the oil is very tightly wound within the cellular structure of the heart tree, making it difficult to extract. There is a benefit to this, however, as sandalwood extract is among the world’s strongest, most distinctive and long-lasting fragrances. 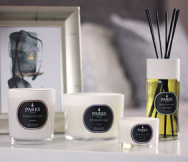 At Parks, sandalwood is among our favourite scents, and the perfect accompaniment to many of our signature fragrances. To view our collection of sandalwood home fragrance products, visit our dedicated page.